Thanks to Dr C. N. Sai Shalini, Sri Ramachandra Medical College, Porur, Chennai (India) for contributing this case, Dr. Hillary Zalaznick, Myriad Genetics, Inc., Utah (USA), for writing the discussion, and to Dr. Hillary Rose Elwood on our Editorial Board for her review. To contribute a Case of the Week, first make sure that we are currently accepting cases, then follow the guidelines on our main Case of the Week page. (1) We have posted a new video of a brief discussion with Dr. Pernick about the past, present and future of PathologyOutlines.com. You can view it here. We hope to post new videos on a quarterly basis. Lymph nodes - not lymphoma, Adult onset Still's disease (AOSD) - micro images. (3) For the Jobs page, we have a new quarterly Jobs Report for the second quarter of 2017 (the link to all Job Reports is near the top of the Jobs page, in orange) that discusses trends in the Job market. At the bottom of the Search Jobs section is a new feature, Regional totals by subspecialty. Just use the drop down box to select the Subspecialty. (4) The Conferences page now lists conferences by Organization, for those that post a large number of conferences in a calendar year, such as ASCP, CAP and USCAP. We have also combined Webinars and Conferences on the same page. A 26 year man presented with a three year history of itchy lesions over his face, neck, back, axilla, hands and legs. 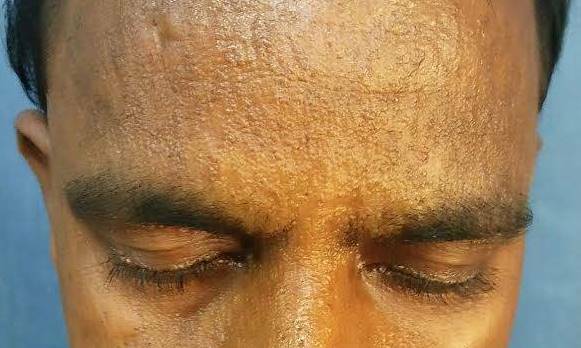 Examination showed beaded papules over both eyelids and waxy papules on his forehead, malar region, back of neck, shoulders and hands. Biopsy was taken from the left upper back. Which of the following is not a feature of lipoid proteinosis? Lipoid proteinosis, also known as hyalinosis cutis et mucosae or Urbach-Wiethe disease, is a rare autosomal recessive disease caused by mutations in the ECM1 (extracellular matrix protein 1) gene. ECM1 acts as a "biological glue" by attaching to other structural proteins in the extracellular matrix. Over 50 mutations have been reported in ECM1, mostly missense and nonsense mutations, leading to a lack of functional ECM1 protein (Mol Syndromol 2016;7:26). 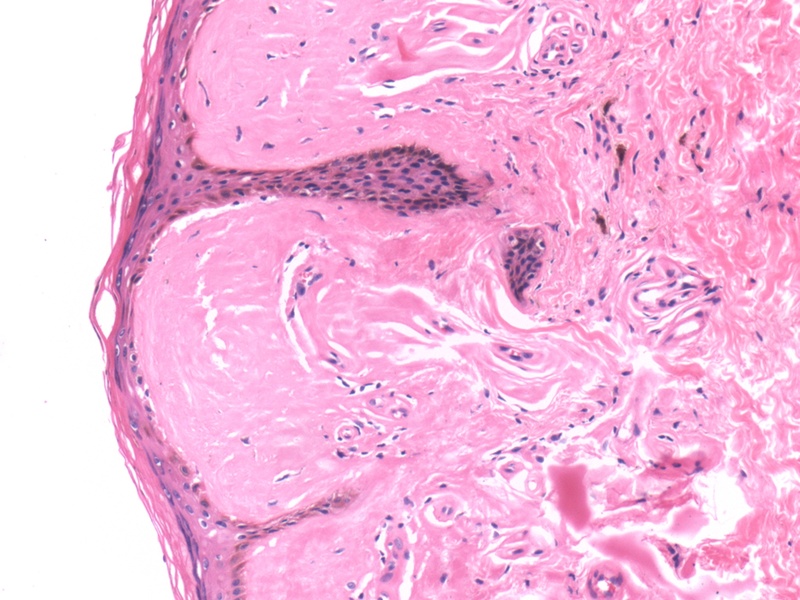 This leads to deposits of PAS-D+ material in the skin and mucosae, although the mechanism leading to these deposits is unclear (Pathol Res Pract 1998;194:855). The disease shows phenotypic variability, even among patients in the same family with the same mutation (Mol Syndromol 2016;7:26). Patients with lipoid proteinosis typically have waxy yellow-white papules, nodules or plaques on the skin, particularly on the face and eyelids ("moniliform blepharosis"). 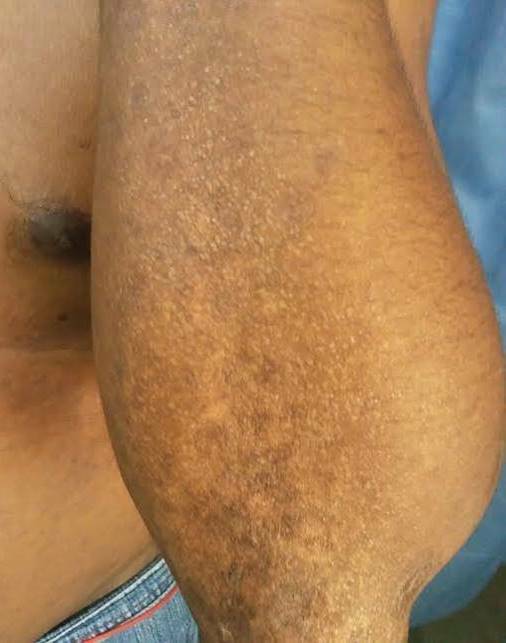 Verrucous and keratotic lesions can be seen on extensor surfaces, particularly on the elbows. Patchy alopecia can occur if lesions involve hair bearing skin. Almost all affected individuals have a hoarse cry as an infant due to involvement of the vocal cords, and a hoarse voice generally persists throughout the patient’s life. Other common mucosal findings are a shortened tongue due to involvement of the frenulum; stenosis of salivary gland ducts leading to inflammation and poor dental health; and vesicles with hemorrhagic crusts in the mouth. Patients can have seizures, as about 70% have a pathognomonic "bean-shaped" intracranial calcification above the pituitary fossa (Pathol Res Pract 1998;194:855). In addition, there may be psychiatric symptoms such as memory impairment, paranoia, aggressive behavior, hallucinations and absence of fear (Gene Reviews® [Internet]). Autopsy studies show that there can be hyaline deposits in any organ system, although they tend to be asymptomatic (Pathol Res Pract 1998;194:855). Adult onset lipoid proteinosis, as in this case, is rare. 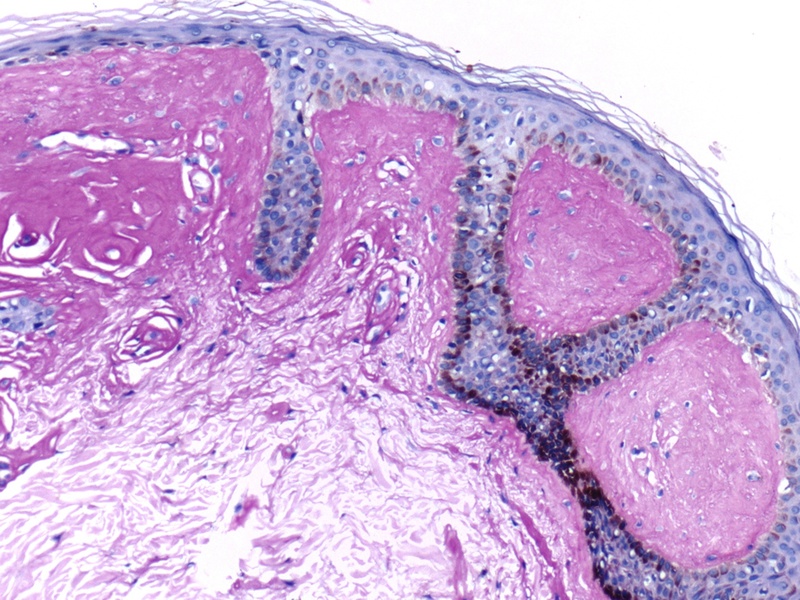 As seen in the above images, the histopathologic hallmark of lipoid proteinosis in a skin biopsy is amorphous, eosinophilic, mostly acellular material in the papillary dermis, particularly near the epithelial stromal interface (Arch Pathol Lab Med 2004;128:e17). It is also present around sweat glands and small blood vessels. The blood vessel walls can be homogenously thickened. In mucosal biopsies, the material is in the lamina propria and around salivary gland canaliculi. Focal chronic inflammation may be present. The hyaline material is PAS and PAS-D positive. The "lipoid" component is not readily appreciable on H&E staining, but droplets of fat within the hyaline material may be seen with a Sudan black stain (Pathol Res Pract 1998;194:855). The main histologic differential diagnosis for lipoid proteinosis is amyloidosis; special stains such as Congo Red can exclude amyloid. 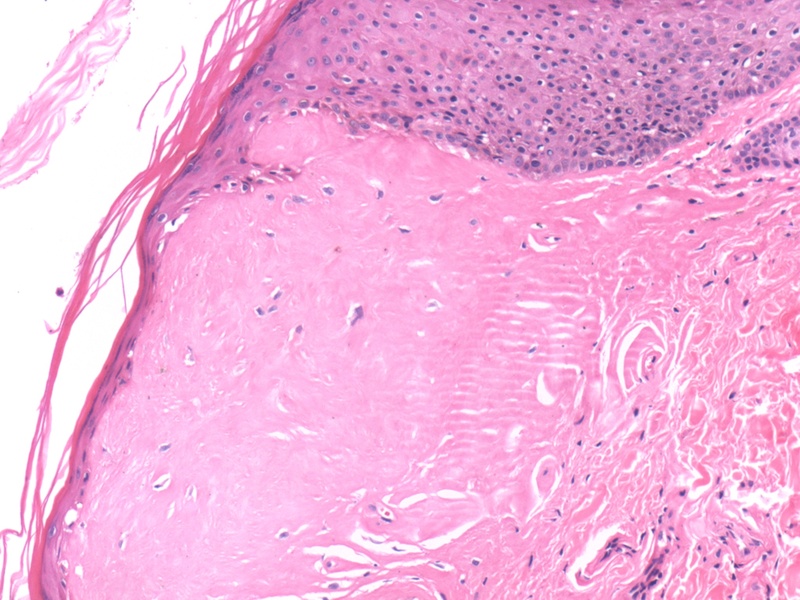 In porphyria, hyaline deposits can be seen around small blood vessels in the dermis, similar to early lesions of lipoid proteinosis; however, lesions in porphyria are limited to sun exposed areas (Pathol Res Pract 1998;194:855). 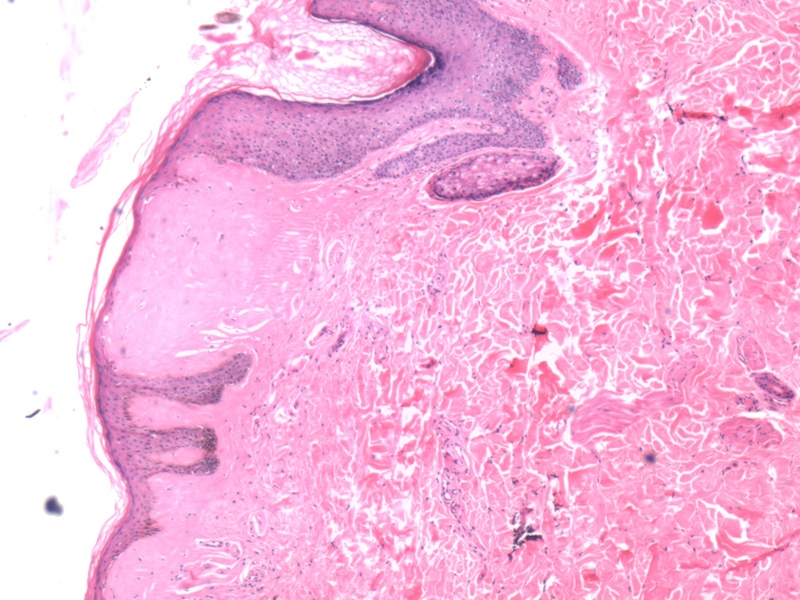 Smokeless tobacco keratosis can sometimes have similar hyaline deposition around vessels and salivary glands, but it also has characteristic epidermal changes limited to the oral cavity, unlike lipoid proteinosis (Arch Pathol Lab Med 2004;128:e17). The diagnosis of lipoid proteinosis can be confirmed by sequencing the ECM1 gene (Gene Reviews® [Internet]). Lipoid proteinosis is slowly progressive, but life expectancy is considered normal. The most serious consequence is airway obstruction from laryngeal involvement; microlaryngoscopic excision of the deposits can be performed, but occasionally patients require tracheostomies. There is no curative treatment for the skin or mucosal lesions (Gene Reviews® [Internet]). B. Lipoid proteinosis is associated with mutations in the ECM1 gene. Defects in the ALAS2 gene are associated with sideroblastic anemia.